Look around for a few minutes and you’re sure to see the SH name. The two go hand-in-hand. The new SH125i will prepare you for the city more than ever before. With distinctive LED lights, Smart Key technology and enough under-seat storage for a full-face helmet, you get a classic, sophisticated style with modern city convenience. There’s even a 12v socket, allowing you to keep your device charged on the move. Looks are nothing without the ability to perform. Fortunately, the new SH125i have both. Large 16" wheels combine with MichelinTM City Grip tyres to o er more control in wet, uneven conditions. Add in ABS as standard and you get a con dence-inspiring riding experience, whatever the weather. 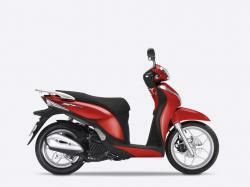 The SH Mode 125, with its compact size and iconic design, is built to take on the world in real style. With Honda’s responsive, fuel injected eSP engine delivering excellent fuel e ciency, plus selectable Idle Stop as standard and Honda’s Combined Braking System (CBS), you can be sure that getting from A to B is enjoyed with con dence and control every time.